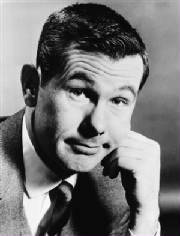 LOS ANGELES (AP) - Johnny Carson, the quick-witted "Tonight Show" host who became a national institution putting his viewers to bed for 30 years with a smooth nightcap of celebrity banter and heartland charm, died Sunday. He was 79. Carson died early Sunday morning, according to his nephew, Jeff Sotzing. "He was surrounded by his family, whose loss will be immeasurable," Sotzing told The Associated Press. But America never tired of him; Carson went out on top when he retired in May 1992. Actress-singer Bette Midler, who memorably serenaded Carson during the final show with "One More For My Baby," recalled him warmly Sunday. NEW YORK (AP) - And so, it has come to this ... With those words, Johnny Carson made his graceful exit from "The Tonight Show" nearly 13 years ago. But few believed he would really be gone. And no one wanted to believe it. Now, with his death at 79, Carson's fans must at last face the truth, and relinquish our long-dimming hope that he might yet pay us another visit on our TV screens. Carson was always a Garbo-esque celebrity who, even at his most prominent, seldom was seen anywhere but behind the fortification of his "Tonight Show" desk, or standing on the star on the studio floor that marked where he delivered his monologue. It was on that spot in May 1992 that he spent the last moments of his final "Tonight" broadcast, seated on a stool as he spoke from the heart. "And so, it has come to this," he began. Then he expressed hope that "when I find something I want to do and think you would like, I can come back" to find fans "as gracious in inviting me into your homes as you have been." But maybe he was just trying to ease the pain of parting, for himself no less than us. "I bid you a very heartfelt good night," he said in the next breath, signing off. An era was over, even more than we could understand - until now. On the occasion of Carson's 70th birthday, former "Tonight" bandleader Doc Severinsen, who toured with musicians from the show, said he was constantly reminded of Carson's enduring popularity. "Every place we go people ask 'How is he? Where is he? What is he doing? Tell him how much we miss him.' It doesn't surprise me," Severinsen said. Carson won a Presidential Medal of Freedom, the nation's highest civilian honor, in 1992, with the first President Bush saying, "With decency and style he's made America laugh and think." In 1993, he was celebrated by the prestigious Kennedy Center Honors for career achievement. 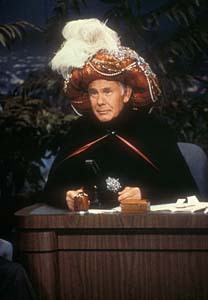 "Laura and I are saddened by the death of Johnny Carson. Born in Iowa and raised in Nebraska, Johnny Carson was a steady and reassuring presence in homes across America for three decades. His wit and insight made Americans laugh and think and had a profound influence on American life and entertainment. He was a patriot who served in the United States Navy during World War II and always remembered his roots in the heartland of America. We send our prayers and condolences to the entire Carson family." 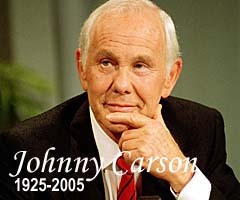 "The death of Johnny Carson is a huge loss for all of us. He was a comedian who not only made us laugh, but also made us stop and think. Ronnie and I always enjoyed him on The Tonight Show and we were honored to know him as a friend. My prayers go out to his entire family at this very difficult time." 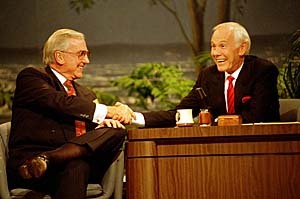 "Johnny Carson was a man I considered like a brother to me. Our 34 years of working together, plus the 12 years since then, created a friendship which was professional, family like and one of respect and great admiration." "I was his last guest, and it was one of the most moving experiences of my life. He had it all. A little bit of devil, a whole lot of angel, wit, charm, good looks, superb timing and great, great class," Midler said in a statement. Good Night Johnny and thanks for all the great laughs and smiles!